What is fibrinolytic therapy and where is it used? What does fibrinolytic therapy entail and what are its applications? Re: What is fibrinolytic therapy and where is it used? Fibrinolysis is the process of degrading fibrin; this is an insoluble protein polymer made from a soluble precursor molecule called fibrinogen. An enzyme called thrombin cleaves one end of the fibrinogen molecule making it sticky so that it links up with other fibrins to form a fibrin network resembling a net. The purpose of this is entrap red blood cells to form a strong plug to block a bleeding vessel. Thrombin is produced when the clotting system is activated in the body, either physiologically to stem bleeding from a wound site, or pathologically such as during an arterial thrombosis in conditions such as a myocardial infarction (MI). In the latter case, removing the thrombus restores blood flow and is associated with improved clinical outcomes. Historically, fibrinolytic / thrombolytic drugs like streptokinase and tPA (tissue plasminogen activator) were the mainstay of treatment. 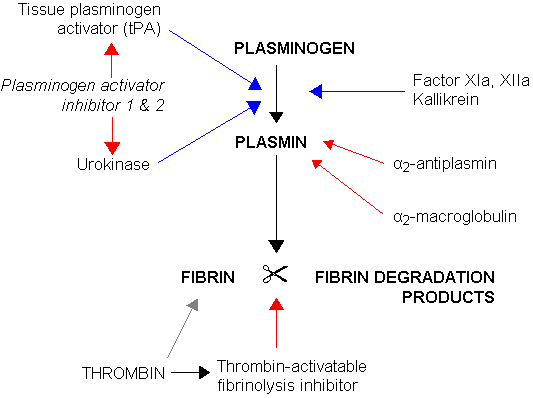 They work by cleaving the protein plasminogen to plasmin, the active form, which attacks fibrin and dissolves thrombus. These agents are still used in some settings, although PCI (angiography, angioplasty / revascularisation and stenting) is now the preferred first line therapy. How does CAR (chimaeric antigen receptor) anti-cancer therapy work? Does oral testosterone therapy affect female mood?